"Lewis and Clark River, Oregon"
Click image to enlarge Lewis and Clark River, Oregon, as seen from Coxcomb Hill. 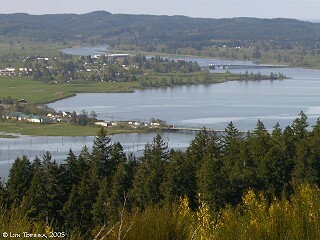 Mouth of the Lewis and Clark River entering Youngs Bay. Image taken April 19, 2005. The Lewis and Clark River is on the Oregon side of the Columbia and enters the southern part of Youngs Bay approximately 2 miles from the Columbia River. 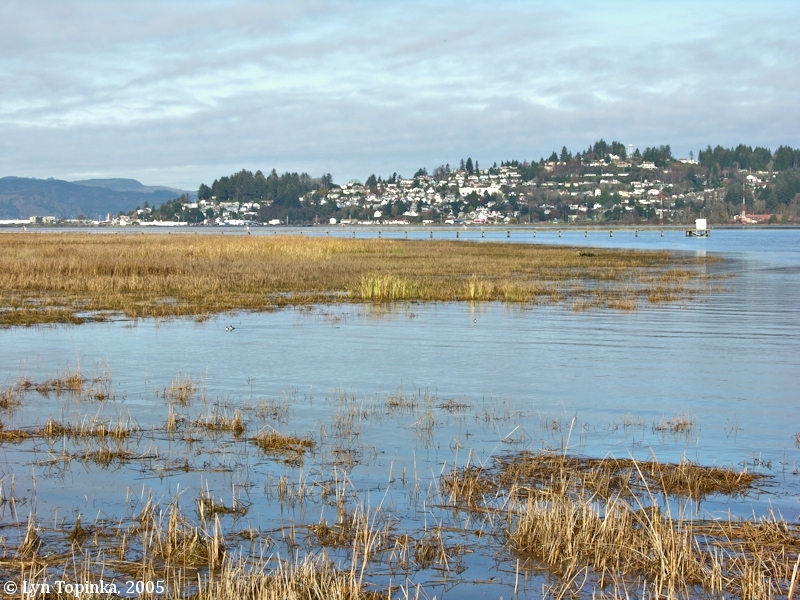 Astoria, Oregon and Smith Point can be seen from the mouth of the Lewis and Clark River. Youngs River enters Youngs Bay another two miles east of the Lewis and Clark River. Captain Lewis first discovered the Lewis and Clark River on November 30, 1805, as he was exploring the Youngs Bay region. The first 100-yard-wide inlet, and the one to which they returned to expore, is today's Lewis and Clark River. The 2-mile-long inlet which they explored and enjoyed lunch along was today's Skipanon River. 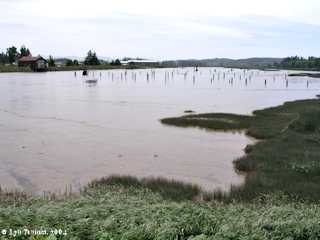 The Lewis and Clark expedition spent the winter of 1805-06 at Fort Clatsop on the left bank of the Lewis and Clark River, which they called "Ne-tul River". The Lewis and Clark River was visited in 1792 by Lieutenant Broughton of the Captain George Vancouver expedition. They erroneously named it "Youngs River". For years scholars assumed Broughton's "Young's River" was today's Youngs River. However current research shows that the "Young's River" on Broughton's map matches up nicely with todays "Lewis and Clark River" appearing on other early Columbia River and topographic maps, and even today's current maps. In 1806 Lewis and Clark called this river "Ne-tul River". However, they also refered to it as "Fort River" in reference to Fort Clatsop, the "fort" they had built for the winter. "The earliest use of the modern name that has come to the compiler's attention is in Lee and Frost, Ten Years in Oregon, 1844, p.15. Silas B. Smith, the authority on Clatsop County history, says that the name Netul referred to a point on the bank of the river rather than to the stream itself." The 1851 U.S. Survey of the Coast of the United States' (today's NOAA) Chart # 641, "Mouth of Columbia River" has the Lewis and Clark River labeled "Lewis & Clark River". It flows into "Young's Bay" along with "Young's River". The map shows the "Lewis and Clark River" entering "Young's Bay" (both named). A small long island is in the center of the river, approximately half way between the mouth of the Lewis and Clark River and the "Log Hut Lewis and Clark wintered in 1805". The island is across and downstream of a tributary entering the Lewis and Clark River. Words on the left of the map are: "Breadth of River at its mouth from 4 to 500 yards - Distance from mouth of River to Hut, where Lewis & Clark wintered, about 2 miles." Words at the bottom of the map are "Tidewater, 7 miles from mouth". An 1856 State of Oregon cadastral survey (tax survey) for T8N R10W has the river labeled "Lewis & Clark's River". "Young's Bay lies between the eastern part of the Clatsop beach (called Tansey Point) and Point George. Into it empty Young's river, discovered, examined, and named by Broughton; Lewis and Clarke's river, examined by them in 1805; and one or two small streams or sloughs." The Lewis and Clark River Bridge was built in 1924, and is the only remaining "single leaf bascule drawspan" in Oregon (2006). The bridge was signed by Conde B. McCullough, an engineer who designed many of the bridges along the Coast Highway 101, including the nearby Old Youngs Bay Bridge. Good views of the Lewis and Clark River Bridge and the Old Youngs Bay Bridge can be had from Coxcomb Hill and the Astoria Column. 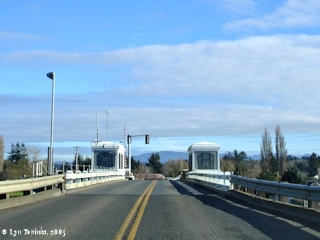 Click image to enlarge Crossing the Lewis and Clark River Bridge. Image taken November 15, 2005. Good views of the Lewis and Clark River can be had from Fort Clatsop, Netul Landing and Coxcomb Hill (the Astoria Column). 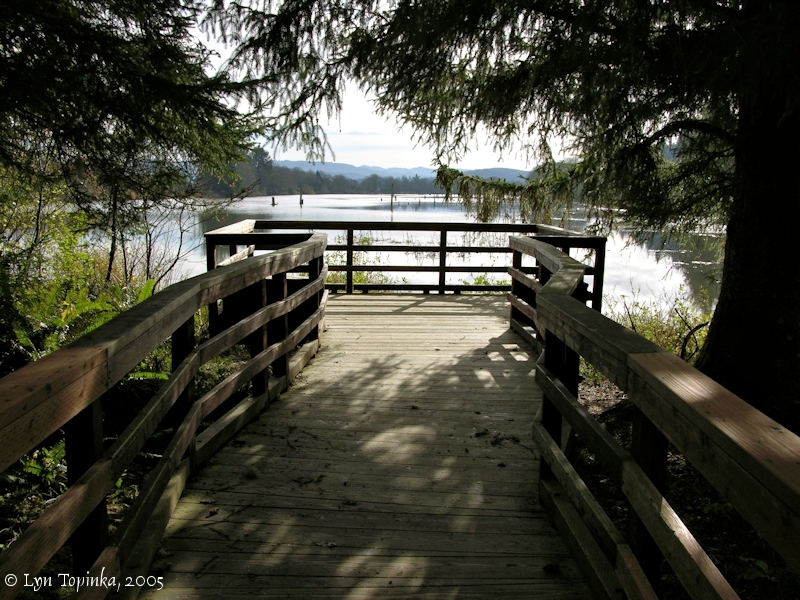 Click image to enlarge Viewpoint at Canoe Landing, with Lewis and Clark River, Fort Clatsop, Oregon. Image taken November 15, 2005. 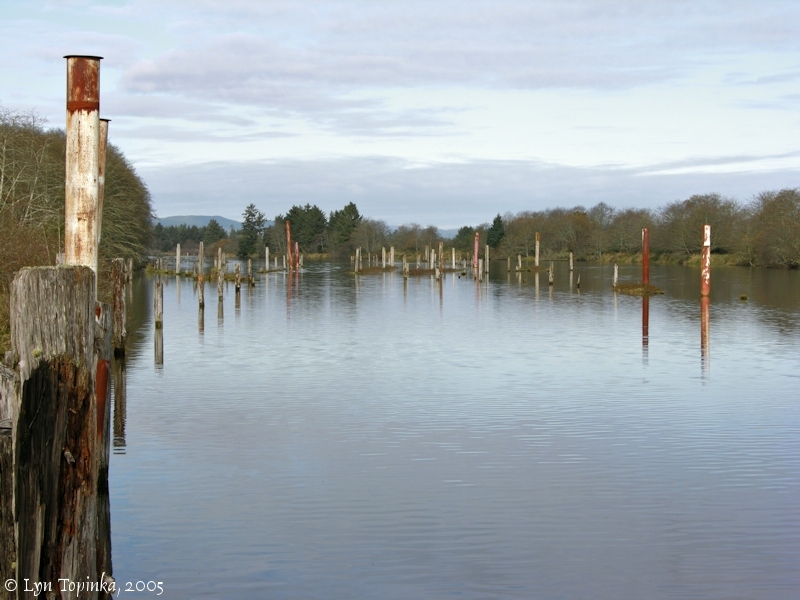 Click image to enlarge Lewis and Clark River, Oregon, from Canoe Landing at Fort Clatsop. Image taken May 25, 2004. Click image to enlarge Lewis and Clark River looking downstream from Netul Landing. Image taken November 15, 2005. 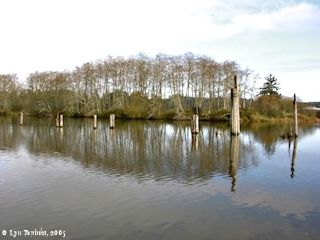 Click image to enlarge Reflections, Lewis and Clark River at Netul Landing. Image taken November 15, 2005. 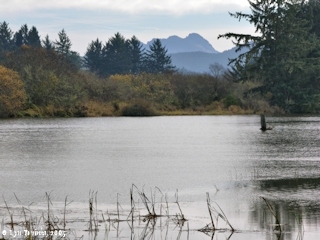 Click image to enlarge Saddle Mountain and the Lewis and Clark River. View from Canoe Landing at Fort Clatsop. Image taken November 15, 2005. 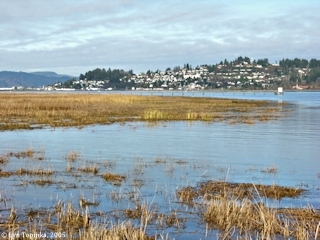 Click image to enlarge Astoria and Youngs Bay, from mouth of the Lewis and Clark River. Image taken November 15, 2005. 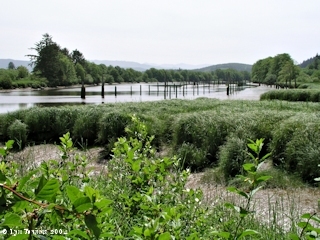 Click image to enlarge Looking upstream from the mouth of the Lewis and Clark River. Image taken May 25, 2004.
this was verry Satisfactory information to all the party. we accordingly deturmined to proceed on to the Situation which Capt. Lewis had Viewed as Soon as the wind and weather Should permit and Comence building huts &c.
Again we had a wet stormy day, so that the men were unable to proceed with the canoes. About 11 o'clock Capt. Lewis and three of his party came back to camp; the other two were left to take care of some meat they had killed. They have found a place about 15 miles from this camp, up a small river [Lewis and Clark River] which puts into a large bay [Youngs Bay] on the south side of the Columbia, that will answer very well for winter quarters [Fort Clatsop], as game is very plenty, which is the main object with us; and we intend to move there as soon as circumstances will admit. There is more wet weather on this coast, than I ever knew in any other place; during a month, we have had three fair days; and there is no prospect of a change. Some rain from 10 to 12 last night, this morning fair, have every thing put on board the Canoes and Set out to the place Capt Lewis had viewed and thought well Situated for winter quarters [Fort Clatsop] - we proceeded on against the tide to a point [Smith Point, Astoria] about [blank] miles here we met Sergt Pryor and his party returning to the Camp we had left without any meat, the waves verry verry high, as much as our Canoes Could bear rendered it impossible to land for the party, we proceeded on around the point [Smith Point, Astoria] into the bay [Youngs Bay] and landed to take brackfast on 2 Deer which had been killed & hung up, one of which we found the other had been taken off by [s]ome wild animal probably Panthors or the Wild [cat?] of this Countrey ... I delayed about half an hour before York Came up, and then proceeded around this Bay which I have taken the liberty of calling Meriwethers Bay [Youngs Bay] the Cristian name of Capt. Lewis who no doubt was the 1st white man who ever Surveyed this Bay, we assended a river [Lewis and Clark River] which falls in on the South Side of this Bay [Youngs Bay] 3 miles to the first point of high land on the West Side, the place Capt. 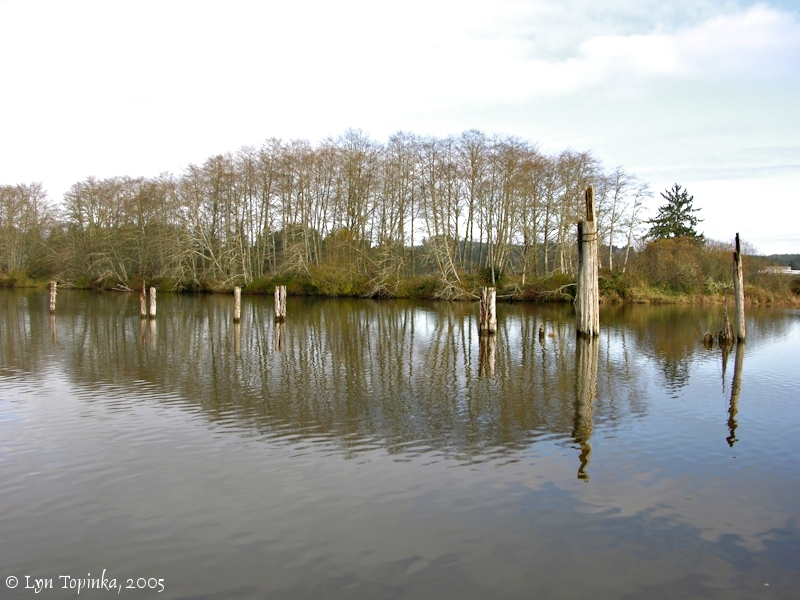 Lewis had viewed and formed in a thick groth of pine about 200 yards from the river [Fort Clatsop], this situation is on a rise about 30 feet higher than the high tides leavel and thickly Covered with lofty pine. this is certainly the most eligable Situation for our purposes of any in its neighbourhood. to point Disapointment [Cape Disappointment] is N. 75° W."
the morning clear we put our canoes in the water loaded up and set out and proceeded on down the River. the Shore is covred thick with pine and under brush. passd. Several Spring runs. the waves ran verry high. we could not land untill we turned a point [Smith Point, Astoria] in a bay [Youngs Bay] where we halted and cooked a young Deer which the hunters had killed the other day. ... we proceed. on round a bay [Youngs Bay] then went up a River [Lewis and Clark River] abt. 3 miles and landed at the place appointed for winters quarters. [Fort Clatsop] this River [Lewis and Clark River] is about 100 yds wide at this place but the tide water extends further up. we unloaded the canoes and carried all our baggage about 2 hundred yards on a rise of ground and thicket of handsom tall Strait pine and balsom fir timber and Camped here we intend to build a fort [Fort Clatsop] and Stay if game is to be found thro. this winter Season. About 12 last night the rain ceased and we had a fine clear morning. We put our canoes into the water, loaded them, and started for our intended wintering place. We coasted down the south side about a mile, and then met with the six men, who had gone for meat. They had brought four of the skins but no meat, the distance being great and the weather very bad. The swells being too high here to land we went two miles further and took the men in. 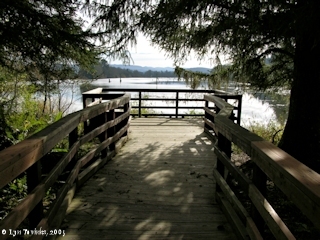 We then proceeded round the bay [Youngs Bay] until we came to the mouth of a river [Lewis and Clark River] about 100 yards broad, which we went up about 2 miles to the place fixed upon for winter quarters, [Fort Clatsop] unloaded our canoes, and carried our baggage about 200 yards to a spring, where we encamped. The wind rose, & the wind caused the Waves to rise also. We saw our 6 Men, who had been for the Elk meat, on the Shore. The Waves ran so high, that we could not land where they were, and had to turn a point of land [Smith Point, Astoria], to make a harbour; the 6 Men joined us at this place. ... We proceeded on to a deep bay [Youngs Bay] about 8 Miles, & went up a River, [Lewis and Clark River] which was about 100 yards wide. We then unloaded our Canoes & carried all our baggage, about 200 yards to piece a rising ground in a thicket of tall pine Trees; [Fort Clatsop] where we intend building Cabbins, & stay if Game is to be had through the Winter season. the river on which Fort Clatsop stands we now call Ne-tul, this being the name by which the Clatsops call it. The party that was Sent up the Netul river for the Elk returned this evening with three of them only; The Elk had been killed just before the Snow fell which had Covered them and So altered the apparant face of the Countrey that the hunters Could not find them. The River on which Fort Clat Sop Stands we now call Netul, this being the name by which the Clatsops Call it. a fair morning. twelve men Set out after the Elk meat. the day Showery and wet. in the evening the party returned except four who Stayed out to hunt & brought in the meat. the Indian Name of the River they went up is Kil how-a-nàk-kle [Youngs River] and this River which we are on Ne-tul [Lewis and Clark River].